Visit the market on Thursdays. High quality, fresh local products available. Market Place, Oundle. Local Artist Simon Dolby. Found by the River Nene, Oundle is a gem! Oundle Town Council provides YOUR local services. We strive to make Oundle a better place to live, work and visit. Our website includes a wealth of information about how we conduct business and what we do. Use the search or browse the site to find whatever you are looking for. 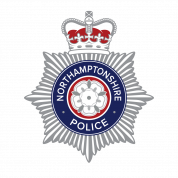 If you can't find what you want or would like to recommend any improvements to our website then please contact us. 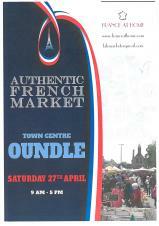 Saturday the 27th of April will see the 3rd visit to Oundle of our popular French Market. 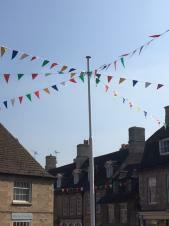 And the bunting is back...must mean spring/summer/festival time is here! Starting with Oundle Festival of Music & Drama tomorrow 30th March! Enjoy the sunshine Oundle! 187,111 page views over twelve months, updated daily. HTML5 validated. WCAG compliant. Page generated in 0.2084 seconds.